We’d love your help. 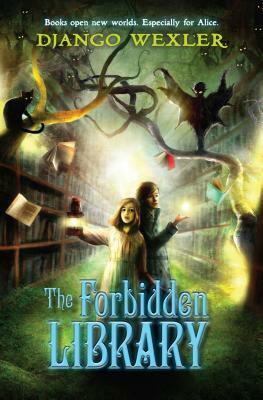 Let us know what’s wrong with this preview of The Forbidden Library by Django Wexler. The Forbidden Library kicks off an action-packed fantasy series with classic appeal, a resourceful heroine, a host of magical creatures, and no shortage of narrow escapes--perfect for fans of Story Thieves, Coraline, Inkheart, and Harry Potter. When The Forbidden Library kicks off an action-packed fantasy series with classic appeal, a resourceful heroine, a host of magical creatures, and no shortage of narrow escapes--perfect for fans of Story Thieves, Coraline, Inkheart, and Harry Potter. To ask other readers questions about The Forbidden Library, please sign up. I loveeed this book, its a perfect mix of adventure and fantasy. However I'm wondering where I can find the series, beacause I really want to finish the ending? is it possibly frightening for children? Fair warning -- I wrote the book, so my review is probably a little biased. But it looked lonely with no reviews at all. I'm a big fan of Django Wexler's work. His adult epic fantasy The Thousand Names blew me away last year, putting him on my favorite author radar so I've been keeping an eye out for more from him ever since. This past year I've also read the first book of his new novella series John Golden, gone back to read one of his older published novels from a small press, and of course this one, The Forbidden Library, his upcoming middle-grade title. Anyway, I think it's official: Wexler excels at pretty much any genre he tries his hand at. I was initially curious and maybe a little skeptical as to how he would handle a children's novel, but this book was truly excellent. The author shows his talent and versatility in The Forbidden Library, creating original worlds filled with all kinds of interesting creatures, bringing them to life with such rich and detailed descriptions. I have no doubt adult readers will be enchanted by the wonderful creativity and imagination found in here as well. The story itself is fantastic, and as an avid bibliophile it's hard for me to resist anything to do with libraries or reading about the wonderful books that take us to faraway places. As you'll see, the metaphor of books as portals to new worlds is actually quite literal in this case. The plot follows main protagonist Alice, a young girl who discovers she has a very special power. Called "Readers", people like Alice possess the ability to enter the worlds of certain books, which might seem great at first, until you realize these books serve as prisons to nasty creatures and the only way out again is if the Reader can defeat them. However, if a Reader is successful in defeating and binding a creature, he or she will escape and also have access to its abilities. I thought this was a very sophisticated and inventive idea to explain how people like Alice derive their magical powers. Their spells are achieved by calling upon the creatures they control to channel it for them, and presumably a Reader can grow more powerful by defeating more creatures in "prison books" and taking control of their abilities. The plot also had enough mystery to keep me constantly guessing; I could never be sure what everybody's motives were. I felt for Alice and her predicament of being suddenly thrust into a strange environment where she couldn't trust anyone, though she was far from helpless and I'm sure she had no need for anyone's sympathy. Courageous and headstrong, Alice is a good role model for young readers, being a take-charge kind of girl who doesn't take obstacles or setbacks lying down. In some ways, The Forbidden Library was more complex than I would have expected from a middle-grade novel. While it had its fair share of levity (Ashes the talking cat will be a joy to many, for example -- and not just to cat-lovers! ), it also had its moments of darkness. Sometimes it's both light and dark at once, as evidenced by the "Swarmers", Alice's horde of bizarre bird-like creatures that have the physical appearance and consistency of a rubber ball with legs. I confess, reading this made me want an army of Swarmers of my own -- in spite of the fact they're essentially a black mass of razor-sharp pecking beaks and I'd probably lose an eye. Like I said, the magical creatures found in this book and the sheer imagination behind them are a pure delight. Another of those young adult books which is totally readable by not so young adults like me:) The Forbidden Library is full of magic and books, talking cats and dragons and people who can read themselves into books. Slightly reminiscent of Jasper Fforde but in this case the main character, Alice, is not in control of where she is going and the results are frequently scary. I enjoyed the whole thing very much indeed and it was further complemented by some delightful illustrations. Finally I discov Another of those young adult books which is totally readable by not so young adults like me:) The Forbidden Library is full of magic and books, talking cats and dragons and people who can read themselves into books. Slightly reminiscent of Jasper Fforde but in this case the main character, Alice, is not in control of where she is going and the results are frequently scary. I enjoyed the whole thing very much indeed and it was further complemented by some delightful illustrations. Finally I discovered that it is the first book in a five part series. Wonderful! Thrown into a world that could only live in dreams or nightmares. Alice is thrown into a world where "Readers" can travel into the world of books meet, fight and capture creatures to harness these magical creatures abilities and find magical words. This world has a deeply dark side with older ancient Readers using any means necessary to gather and steal each others books in order to gather this magic using their Reader apprentices to do their dirty work as pawns in a game that seem to have no end. Alice is at a lost in this world not knowing she a Reader herself and with the sudden death of her father, she must quickly learn to survive this new world she has found herself in, find out the truth of what happen to her father and those who are known as Readers. The world that Django Wexler created in Forbidden Library is vast and unique with "Readers" entering the books they read that is very real and very dangerous. I loved all the creatures that inhabited this world from the talking cat Ashes, to The "Swarm". Like the Ancient Readers you can't trust whose on whose side or what they want. Then there's Alice new to this world and stuck in the middle of it all. Unraveling the truth through the story is Alice just a mere pawn to the Reader's whim or is there hope resting on Alice shoulders. I truly liked and respected Alice, at a young age she has alot to handle, and she handles it very well with a level head and thinking things through alot that gets her out of many dangerous situations she placed in. Never far from her thoughts is her father who she wonders what happen to and whose behind his death. With the slow building mystery takes up alot of the book, and this started off a tad slow for me, when it finally hit it stride, your craving more from this book your zooming toward the end! I completely loved The Forbidden Library and can't wait to see what's in store from this series. Jos jedna brza i vrlo zabavna knjizica sa interesantnim glavnim likom (female and smart... gasp that's possible :P ) i odlicnim magijskim sistemom. Ovo narocito lezi nama koji volimo da citamo da imamo moc koja nas transportuje u knjige ili druge svetove di je knjiga samo portal. Probemi sa kojima se junakinja srece se resavaju kombinacijom brzog razmisljanja i koriscenjem sile i sve je odlicno opisano. Pored svega toga knjiga prosto odise odlicnom gotskom atmosferom, spooky i scary je a opet nig Jos jedna brza i vrlo zabavna knjizica sa interesantnim glavnim likom (female and smart... gasp that's possible :P ) i odlicnim magijskim sistemom. Ovo narocito lezi nama koji volimo da citamo da imamo moc koja nas transportuje u knjige ili druge svetove di je knjiga samo portal. Probemi sa kojima se junakinja srece se resavaju kombinacijom brzog razmisljanja i koriscenjem sile i sve je odlicno opisano. Pored svega toga knjiga prosto odise odlicnom gotskom atmosferom, spooky i scary je a opet nigde ne pise its scary vec sami opisi i razgovori izazivaju taj osecaj i obozavam to kada pisac ide varijantom pokazi a ne pricaj samo o tome. Sama prica je u sustini dosta jednostavna ali je tako jedinstveno prikazana da to uopste ne smeta. So, SO good. Django Wexler is one of those writers who, like Gaiman, Rowling, Snicket, and Lewis, can write a perfectly presented children's book that will also appeal to adults. Alice, the primary character, is clever, brave, and determined to find her father. She's a reader, and in this world that is a Reader, because that's where the magic in this book is found. There is some delightful wonder in this book (the cats and the swarmers were my favorites) but it's also one of those books that is So, SO good. Django Wexler is one of those writers who, like Gaiman, Rowling, Snicket, and Lewis, can write a perfectly presented children's book that will also appeal to adults. Alice, the primary character, is clever, brave, and determined to find her father. She's a reader, and in this world that is a Reader, because that's where the magic in this book is found. There is some delightful wonder in this book (the cats and the swarmers were my favorites) but it's also one of those books that is much more than just a pleasant presentation -- the themes here are complex and nuanced, and the dangers that Alice faces are extremely real. The characters that surround Alice are nuanced -- there are no simple people or easy allies, instead Alice has to realize that everyone around her has a hidden agenda (sometimes more than one!) that may or may not be in her best interest. There is a very interesting ongoing theme of Alice encountering very cute things that turn out to be extremely dangerous. And Alice finds herself being faced with hard, morally complicated decisions about what she is willing to do in order to survive. There's also a strong emphasis on Alice getting herself out of danger, using only her own abilities and her own wits, rather than waiting for someone to save her or for the problem to conveniently resolve itself. I also can't state enough how beautiful the illustrations are. Wexler has a wonderful way with description, and the illustrations are delightful little Easter eggs tucked in among the text. I really, really loved this book. Here we have a young, smart, capable, and brave young lady thrown into a completely new world where magic is real and books can transport you to magical places. It was whimsical and funny and slightly creepy and had an interesting mystery and premise. What more could you want in a book? I wanted to read this book the moment I found out about it. It sounded like the perfect blend of fantasy, magic and adventure - and in a magical library, no less! with talking cats! So I jumped into it excitedly, once I got my hands on a copy. I expected to like it. I wanted to like it. It took me more than half the book to even get into it at all. Until then, it was a struggle. It had all the right ingredients, but it lacked something. Spirit? Excitement? I don't even know. Everything I wanted to read this book the moment I found out about it. It sounded like the perfect blend of fantasy, magic and adventure - and in a magical library, no less! with talking cats! It took me more than half the book to even get into it at all. Until then, it was a struggle. It had all the right ingredients, but it lacked something. Spirit? Excitement? I don't even know. Everything was there that should have worked, but it just failed to grab me, plodding on slowly. I couldn't put my finger on it for the longest time, until I worked out at least one of my big problems with the book (and not just this book): there are middle grade books that work on multiple levels, with subplots and secondary characters with their own lives, with people who have histories, people who have more than one interest; and then there are middle grade books which are... simpler. Much, much simpler. This is one of those, or at least it was for me. It's a book that has exactly one (plodding, slow) plot. It's not a tree with branches going off, branches of secondary plot points or action outside the main narrative thread. It's a ... post. A straight line. It's completely linear. It's all about Alice going from point A to point B, with some stops along the way but never, ever branching off, doing anything that isn't directly plot-relevant. There's not a single character she meets that is anything but a plot-relevant prop, there to either hinder her or help her (or sometimes both at once). I didn't really get the impression of any of those characters as real people with lives outside of Alice's plot; whenever they weren't needed, they were just put aside on a shelf, waiting for the next time they'd need to turn up. That's not to say that a completely linear children's adventure is a bad thing. No, it's not. It's rarely as satisfying as a multi-level adventure, populated with real people with histories and own lives outside of their interactions with the protagonist, but most adventures for young children are linear like this. Except that I did get the feeling this was aimed mostly at younger teens, not so much 8-year-olds. I'd be a lot more forgiving if the pace had picked up faster, though. As I said above, it took me more than halfway into the book before it felt like the introductory parts were behind us and the real adventures started. And the latter half of the book was more ... well, if not entirely satisfying, then certainly faster-paced and more exciting, even if it felt more like a handful of separate little adventures strung together than a coherent narrative. I also had some problems with the magic in the book. It's not explained very thoroughly - somehow some people just have the ability to "Read", i.e. to read specific books that have magical creatures in them? and then they can kill or bind those creatures and afterwards they'll have the magical powers of those creatures at their disposal, and can use the creatures as slaves? - and I felt quite uncomfortable with the underlying evil of this whole system. Yes, it's a point in the book: Readers - sorcerers - are cruel, twisted, evil people who think nothing of killing and hurting others because it's what their entire magical power relies on; but considering how easily Alice takes to that (and that's another thing - it came to her entirely too easily) and how she takes little convincing to use the powers she's obtained, even while arguing it's not right and she'd rather make the creatures submit than kill them outright, well. Alice was a reasonably okay protagonist otherwise, resourceful and courageous, but I do admit the entire system just doesn't sit well with me. Actual rating is more like 2.5, maybe 2.25 - the first half of the book would barely be a 2, the second half perhaps almost a three - but I'm trying to rate this considering how someone in the actual target group might like it. I think an eight-year-old me would have liked it a little more than current me (although the eight-year-old me was also into considerably more complex adventures), so three stars it is. I read Wexler's previous book (The Thousand Names), and liked it well enough that I picked this up even though I saw that it was aimed at a younger audience. I didn't expect to like it *quite* as much, due to that fact. I needn't have worried. I loved this book. It may seem like an exaggeration, but with 'The Forbidden Library' Wexler slips under Diana Wynne Jones' mantle - and is fully worthy of it. (Now, if only Miyazaki would option this story, as he did Wynne Jones' 'Howl's Moving Castle,' an I read Wexler's previous book (The Thousand Names), and liked it well enough that I picked this up even though I saw that it was aimed at a younger audience. I didn't expect to like it *quite* as much, due to that fact. And there is clearly going to be even more, because although there are plenty of adventures here, the main mystery remains unsolved, pending publication of a sequel... which I'll be reading. Thanks to NetGalley for the opportunity to read and review this book! A delightful little book, perhaps a bit heavy on the dark atmosphere, given that its target audience are mostly children, but on the other hand, the heroine is a feisty little thing that I'd like to follow through her further adventures. And there are dragons! (The last sentence of the book was the best, btw). Executive Summary: While I don't make it a point of reading much YA, let alone "Middle Grade" books, I enjoyed this enough to pick up the next one when it comes out. I mostly decided to check this one out on the strength of The Thousand Names and generous nature of Mr. Wexler in doing a Q&A with my small Side Reads group last year. I don't have kids of my own, so it's hard for me to gauge how much the target demographic would enjoy this. I can only really weigh in with the thought Executive Summary: While I don't make it a point of reading much YA, let alone "Middle Grade" books, I enjoyed this enough to pick up the next one when it comes out. I don't have kids of my own, so it's hard for me to gauge how much the target demographic would enjoy this. I can only really weigh in with the thoughts of a 30-something fantasy fan. I thought the book has a strong protagonist that hopefully kids could identify with. Someone whose smart, strong willed and adventurous (albeit reluctantly at first). I like the choice of a female protagonist. Fantasy is overrun by young male chosen one stories, so it's always a nice change of pace to have a female. The book follows the apprentice mage trope pretty much, but with a pretty unique magic system that seems well thought out. Being a middle grade book, the rules of the system aren't very flushed out, but that's OK. We learn as our protagonist learns, and I figure more details will become clear as the series goes on. I also like the choice of setting. It seems to be the early to mid 1900's based on the level of technology. This has a good fit to the story being told. The story was mostly fun and kept me wanting to turn pages. It probably also helped that as a "Middle Grade" book I flew through the pages easily finishing the book in only a few hours. The ending was a pretty good stopping place that left me wanting to know what would happen next and about the world and magic system Mr. Wexler introduced. This reminded me of other things; books and tv. Despite the lovely prose, I didn't connect to the characters as much as I'd have liked. Having said that I'm not the target audience and I know younger me would've read it many times, in the dark! Twelve-year-old Alice is a stickler for the rules. She certainly wasn’t trying to eavesdrop when, late one night, she overheard her father’s heated conversation with a fairy, and about her, of all things. Nor could she find it in her heart to speak up about her innocent trespass when her obviously troubled father announced a sudden lengthy voyage at sea. Now his ship is sunk with all hands drowned, and Alice is shooed off to the estate of a supposed uncle she’s never met -- an estate called the Twelve-year-old Alice is a stickler for the rules. She certainly wasn’t trying to eavesdrop when, late one night, she overheard her father’s heated conversation with a fairy, and about her, of all things. Nor could she find it in her heart to speak up about her innocent trespass when her obviously troubled father announced a sudden lengthy voyage at sea. Now his ship is sunk with all hands drowned, and Alice is shooed off to the estate of a supposed uncle she’s never met -- an estate called the Library, and dominated by a labyrinthine example of its namesake. Within its walls Alice has to set the rules aside, because she’s surrounded by creatures that will manipulate her powers as a Reader for their own agendas, and she’ll need to play their game to find the truth about her father. The creatures of The Forbidden Library are probably my favourite thing about the book. They avoid the simplicity of some fairy tales where everything beautiful is good, and everything ugly is rotten to the core; here, even the downright adorable is bloody dangerous. The waspish fairy Vespidian might broadcast his nature from the very first, but you also have hordes of sweet, comical kiwi-like birds that are so murderously dangerous they have to be imprisoned in their own realm, and giant talking cats who are playing the long game in which Alice might be their ally or merely their pawn. Everything and everyone here has its own agenda, and there are no exceptions for family or the presumably future love interest. The closest thing Alice has to a friend is a self-centred talking half-cat. This very agenda-driven magical world is one of the story’s greatest strengths, but in a roundabout way it also contributes to one of its greatest weaknesses, which is the character of Alice. I really wanted to like Alice, because she’s fabulous on paper -- she’s intelligent, resourceful, and self-reliant. But I couldn’t connect to her, and I think the main reason for that is because she has no one she can be a true equal with, no one she can be herself with and thereby give me a hook into her emotions. She doesn’t have any friends. The people we choose as friends and how we choose to be with them are a significant part of who we are at any age, but at Alice’s age, it’s all the more defining. We don’t just love other plucky young lasses of fantasy like Hermione Granger because of her intellect and ingenuity, we love her because of her loyalty and her compassion and her ability to balance emotional vulnerability with great strength, and all of those dimensions that come out of a person in the way they relate to the ones they love. Without those, Alice feels sort of flat. For a bibliophile like myself, book-based magic is an easy sell, but I really do like the magic system presented here. Alice is a Reader, which gives her the ability to read books that would be incomprehensible to an average person. Some of those books are portals to other worlds. Some of them lead into prison realms which hold nasty critters captive, and the only way out is to kill them or force them to submit, at which point they and their powers become the Reader’s to manifest. There’s a good ethical quandary here too -- due to the nature of their acquisition, the Readers’ powers are rooted in death or slavery, which does get called out by at least one character, and it’s not a quandary that Alice can resolve in one book. This is where the book’s other weakness lies, though. This is a library full of magical books that can take you to other worlds. That’s basically everything I ever fantasised about as a kid. I am the target audience for this book (well, okay, the me of twenty years ago is), so I should’ve been really excited. But the other worlds just aren’t really that fantastical. We don’t get to see all that much, and those we do get to see feel like fairly mundane set-pieces rather than wondrous pocket worlds. Even Alice never seemed to have any emotional reaction or sense of wonder about what she was experiencing, when, as someone passionate about books, shouldn’t she be pretty blown away by the fact that they contain worlds and she’s one of the chosen few who can traverse them? Ten-year-old me is off hyperventilating somewhere at the very idea. I like the book enough to continue with the series, for sure. Wexler’s writing is really enjoyable to sink into. He doesn’t talk down to his audience and he has an evocative but not overwrought way of describing things that makes me think I would enjoy his adult books very much. But I’m hoping that this book’s sequels can deliver a little more depth and a little more wonder. All of the ingredients are here, they just need to gel. This was a fun middle-grade book. I like what I've seen of the magic system, especially since it relates to books! I'm pretty sure I'm a Reader. Good entertaining read, will finish the series. Heroines with agency and functional critical thinking faculties are my favorite. As are cats. This book is very awesome, almost like Alice In Wonderland so yeah you end up in a book!! Anyway this is an awesome book especially since it talks about my most favorite thing in the world!! BOOKS, and it very nice almost like Inkheart. The Forbidden Library by Django Wexler is a middle-grade story about a girl named Alice who stumbles into a world where reading books literally takes her to new worlds. Unfortunately, those worlds seem to frequently be filled with deadly beasts and the real world with ancient and heartless Readers doesn’t seem all that much better. The Forbidden Library pulled me in the second I saw the first illustration and I can’t wait for the sequel! The ARC I read didn’t actually have all the illustrations The Forbidden Library by Django Wexler is a middle-grade story about a girl named Alice who stumbles into a world where reading books literally takes her to new worlds. Unfortunately, those worlds seem to frequently be filled with deadly beasts and the real world with ancient and heartless Readers doesn’t seem all that much better. The Forbidden Library pulled me in the second I saw the first illustration and I can’t wait for the sequel! The ARC I read didn’t actually have all the illustrations either, so I’m planning on buying the finished copy just so that I can go through and see all the ones that I missed; I’m that in love with these illustrations ;-). Note: I received The Forbidden Library from the publisher in exchange for an honest review. Some things may have changed in the final version. I mentioned the amazing illustrations right? The first one is actually of this creepy poison-sprite thing and I had to keep reading for a while after seeing that one before I could fall asleep! The creativity and inhuman-ness portrayed in these drawings is really phenomenal and I’m so pumped to see the rest in the final copy. It’s really fortunate that there are illustrations in The Forbidden Library because the creatures that Wexler has come up with are way beyond the typical fantasy critters. The descriptions of these creatures evokes all sorts of great imagery as I tried to keep in mind that they weren’t the fantasy creatures I was used to, but I think the illustrations will really help with this, so get excited! Alice is a bookish MC, which is kind of a given since The Forbidden Library is about book magic, but she felt very fresh to me. She reminds me a bit of a young Hermione, which was fun, but she also has a cold streak to her that will be interesting to see developed. The things that she has gone through as a young girl have definitely started to have an effect on her sense of morality, which is intriguing to see in a young character. While the plot of The Forbidden Library is fairly simplistic, there are a number of hints revealing that deeper things are going on and I have a lot of hope for the series as a whole. There are some ancient forces at work in The Forbidden Library and it looks like they are going to be far more interested in Alice than she probably would like. The magic system of The Forbidden Library is cool, but kind of immoral. In order to get a creature’s power, Alice has to literally kill it or force it to submit. She then can summon it at will and it has to follow her commands. There is a lot of talk among the intelligent bound creatures of just how similar this is to slavery of intelligent things and I just didn’t know how to feel in the end. I want to be excited about Alice gaining power and cool magic, but if it comes at the expense of her having to seek out and kill intelligent beings? That made me a bit uncomfortable and I hope that Alice realizes this isn’t a good way to go later in the series. There aren’t many secondary characters that Alice really bonds closely with in The Forbidden Library. For one reason or another, things just don’t turn into solid friendships, which is one of those things I’ve come to expect from a middle-grade book ya know? In the end, I just felt lonely along with Alice and wished that she had at least one person she could actually rely on. The Forbidden Library only barely brushes the surface of this magic system and I found myself a bit confused and wanting more information. There are prison books and portal books and perhaps other types of books? We briefly get to see how magic books are made, but it’s still a bit fuzzy. I kind of wished that Alice had had more time to learn even if it meant less time battling book monsters. Reminds me of a cross between Inkheart and Girl Who Circumnavigated Fairyland in a Ship of Her Own Making - the ability to enter books crossed with a heroine with a wonderfully strong sense of agency. I know this was meant for a younger audience but I loved this story. The magic system is very creative and I can't help but feel Harry Potter fans would love this series. The Forbidden Library Saga is far more appetizing to me than any other Django Wexler’s books, perhaps because of the many grains of fantasy that dissipate through its pages from the very beginning. For me, the initial impression it left was: the mixture of all fairy-tales. It firstly reminded me of Coraline because of the cat that guides Alice through the book labyrinth; next, it spectaculously morphed into a Graveyard book when Mr. Black’s character appeared-his name really reminded me of poor The Forbidden Library Saga is far more appetizing to me than any other Django Wexler’s books, perhaps because of the many grains of fantasy that dissipate through its pages from the very beginning. She also meets another Reader’s apprentice just like herself-Isaac-and I have a feeling there will be a romance developing between these two. There is yet another thing that should be mentioned-Alice’s father seemingly dies at the beginning of the book and she is also trying to discover is he really dead and who is to blame for all that. I was fortunate to get an advanced copy of this book at NYCC. This is a fantasy adventure tale for middle graders and older. Not all books are equal. Some books are more than just a collection of words but are magical portals. Such special books also serve as a form of containment unit for various creatures. The select few who can open these portals are called 'Readers' because they can read themselves into a book. This ability, however, comes with a catch. Once inside a book, the only way out is I was fortunate to get an advanced copy of this book at NYCC. This is a fantasy adventure tale for middle graders and older. Not all books are equal. Some books are more than just a collection of words but are magical portals. Such special books also serve as a form of containment unit for various creatures. The select few who can open these portals are called 'Readers' because they can read themselves into a book. This ability, however, comes with a catch. Once inside a book, the only way out is for the Reader to subdue the creatures inhabiting it. Once subdued, a Reader exercises a measure of control over the creatures. Alice is one such Reader though she has only recently discovered this. As she learns the nature and extent of her abilities, it also tests her moral, mental and physical fortitude. She must navigate the waters of this new expansive universe as well as distinguish between friend and foe. Well-mannered, courageous, resourceful and possessing integrity an adult would envy, Alice makes for a fantastic lead, a great character for a young reader to relate to and emulate. She makes mistakes and is no stranger to suffering, but she persists and manages to maintain and fortify her innate center. I can imagine my ten-year-old self reading this after everyone has gone to bed, as was my habit. I would have been engrossed by this thrilling adventure that does not talk down to me. 'The Forbidden Library' is more complex than you might think. I like the idea that an enterprising young reader would be so caught up in the story as to meet any unfamiliar words by an immediate recourse to a dictionary and complex themes by an impatient query to, and/or discussion with, his/her family and friends. This book titillates with adventure, suspense and heroism that would appeal to children and adults alike. It has the rather rare quality of a book that manages to entertain and satisfy on many different levels. It would also likely provide a different takeaway after each read. If I have any beef with this book, it's that it intentionally leaves open threads as it shall be a continuing series. Huge thank you to Kathy Dawson Books and Netgalley for this ARC! Ever since I saw the cover for The Forbidden Library, I knew I had to have it. I love library adventures, and when a book is set in a library or is about uncovering ancient information, or it just has a lot of humor in its approach, I just get giddy on the inside. Django Wexler's The Forbidden Library is fairly dark at times for a children's book, but there's a lot of mystery and intrigue, just as their is courage and crazy. Alice is Huge thank you to Kathy Dawson Books and Netgalley for this ARC! Alice is a solid protagonist. She's plucky, quirky, adventurous and lovable. Her narrative is very engaging, and her curiosity often gets the better of her. She's paired with a fantastic ensemble cast, from Ashes, the talking cat, to sweet, adorable Isaac. The main mystery within the story is that Alice loses her father to a mystery shipwreck and is forced to move in with her Uncle Geryson and his talking cat. To survive a shipwreck is unlikely, but Alice believes that considering the bizarre circumstances of how it happened that he could have potentially survived. Wexler writes beautiful prose and description. There's an exquisite amount of detail in how he describes Alice and the world that surrounds her. The prose is really what kept me completely sucked into the story, and I had a hard time putting the book down because I wanted to uncover each and every one of the mysteries that is within the novel. In a lot of cases, this book is a mystery, wrapped in another mystery, wrapped in an enigma. There's always more questions than answers, and as answers begin to form, more questions appear. It makes for a fun and engaging read a lot of the time, and Wexler definitely went in some directions I didn't entirely expect him to go. When I was searching for Harry Potter books, this book pop up on a searching area and from the title “forbidden library” I thought what this book is? Not allowed books or from the cover I thought is the horror library! Honestly, for any book, wants to read or download, I will search for the author or the book its self, but it was the first time reading Django Wexler's book. So when audiobook downloaded, I can say that I loved this book so much! The story about a young, smart, capable, and brave When I was searching for Harry Potter books, this book pop up on a searching area and from the title “forbidden library” I thought what this book is? Not allowed books or from the cover I thought is the horror library! The story about a young, smart, capable, and brave girl thrown into a whole new world where magic is real, and books can transport to magical places that were fascinating and at the same time scary for this young lady to have someone who does not like! With having a plucky heroine, talking cats, magical books. Moreover, even a dragon. I tried to listen on the late night in the room in the middle of books, and with vocal variety from audiobook reader, I can sometimes be feeling the book! So I am happy to read this book and recommend all users to read forbidden library to see what's going on? I feel a special affinity for books about the magic of books and reading. There’s a special connection there when the author totally puts the magic of words right down on the page, quite literally. Thus, when The Forbidden Library by Django Wexler landed on my door step, I knew that I would have to clear some time in my schedule for the intrepid young heroine Alice, a feisty cat, and a stowaway. As usual, making time to read middle grade fantasy was an excellent life choice. It turns out that I I feel a special affinity for books about the magic of books and reading. There’s a special connection there when the author totally puts the magic of words right down on the page, quite literally. Thus, when The Forbidden Library by Django Wexler landed on my door step, I knew that I would have to clear some time in my schedule for the intrepid young heroine Alice, a feisty cat, and a stowaway. As usual, making time to read middle grade fantasy was an excellent life choice. It turns out that I really enjoyed my time with The Forbidden Library, taking in the creative world building and the lovely touches that the interior art provides. If you’re looking for a book to wait on this Wednesday, let The Forbidden Library be the one. I liked this book, and I loved Alice as a character -she has so much agency- but I really hate it when a book doesn't wrap up any of its conflicts by the end. I couldn't believe it was over because literally none of her problems have been solved. I felt like I reached the end of the sample, not the end of a book.